As head of the Environmental Protection Agency, Pruitt was Trump's point man for the administration's plan to roll back environmental regulations. Environmental Protection Agency Administrator Scott Pruitt, who has faced mounting public outcry over multiple ethics scandals, resigned on Thursday, President Donald Trump announced in a pair of tweets. Trump said he had accepted Pruitt's resignation, adding, "Within the Agency Scott has done an outstanding job, and I will always be thankful to him for this." Andrew Wheeler, the EPA's No. 2, will assume the role of acting administrator on Monday, the president said. Pruitt is the fourth member of Trump's original Cabinet to depart, following Veteran Affairs Secretary David Shulkin, Secretary of State Rex Tillerson and Health and Human Services Secretary Tom Price, who resigned amid his own scandal over taking charter flights at considerable taxpayer expense. Despite months of headline-making scandals surrounding Pruitt and his alleged abuse of agency resources, Trump had staunchly defended his embattled EPA chief. In recent weeks, however, White House officials had hinted that Trump's patience could be wearing thin. On Tuesday, White House spokesman Hogan Gidley called the increasing number of reports about Pruitt "troublesome" and "something we're taking a look at." Then, earlier Thursday afternoon, The New York Times reported that a senior scheduler for Pruitt had been fired after she questioned why people in his office were retroactively deleting meetings from the calendar. "It is extremely difficult for me to cease serving you in this role first because I count it a blessing to be serving you in any capacity, but also, because of the transformative work that is occurring," Pruitt wrote. He then went on to say that he believes Trump is president "because of God’s providence." "I believe that same providence brought me into your service," Pruitt said. 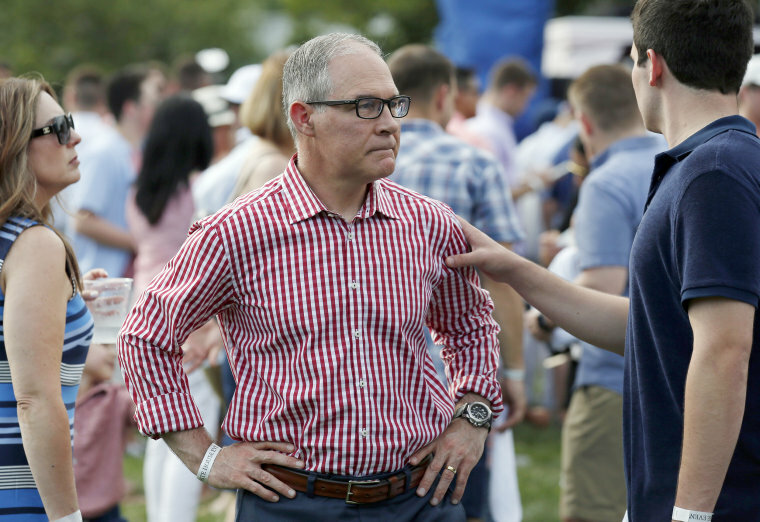 Pruitt was among the Cabinet secretaries in attendance at the White House's Fourth of July event for military families Wednesday. Speaking to reporters aboard Air Force One after the resignation was announced Thursday, Trump again voiced his support for Pruitt and said the allegations hadn't bothered him. "There was no final straw," Trump told reporters aboard Air Force One. "Scott is a terrific guy. He came to me and he said: 'Look, I have such great confidence in the administration. I don’t want to be a distraction.'" The president said Pruitt approached him about resigning "a couple of days" ago. "We’ve been talking about it for a little while," Trump said. “He'll go on to great things. He’s going to have a wonderful life, I hope,” Trump said. As the head of the EPA, Pruitt was Trump's point man for the administration’s plan to roll back environmental regulations, many of which were put in place by the Obama administration. In the year he has served as the Trump administration's top environmental official, Pruitt moved to quash or replace numerous environmental regulations opposed by industry lobbyists while boosting the continued burning of fossil fuels, which scientists have concluded is the primary cause of climate change. However, his tenure was quickly overshadowed by a barrage of media reports that detailed questionable spending and management decisions, including revelations of frequent first-class travel and expensive trips at taxpayer expense, reports of big pay raises for top aides without White House approval and reports that he sidelined staff who questioned him. Later, it was revealed in congressional testimony that he routinely tasked EPA aides with carrying out personal tasks for him and other members of his family. As a result, Pruitt is the subject of 15 ongoing federal inquiries being conducted by the agency's internal watchdog, the Government Accountability Office, the House of Representatives and the White House, according to an NBC News count. One additional probe, completed by the GAO, concluded that he broke the law by installing the $43,000 phone booth. Other investigations or audits, opened by the agency's inspector general, include examining a $40,000 trip to Morocco, Pruitt's meetings with industry groups and the use of his security detail during personal trips to the Rose Bowl and Disneyland. Before joining Trump's administration, Pruitt served as Oklahoma's attorney general and sued the agency he would later go on to run more than dozen times over the clean air and clean power rules enacted by the Obama administration. Pruitt, however, was not the only EPA bigwig to face ethics questions. Deputy administrator Wheeler, officially on the job since April and now the agency's acting chief, was among 30 federal employees who were allegedly working in violation of Trump's own executive order to keep the government free of former lobbyists. Government watchdog group Public Citizen filed an ethics complaint against Wheeler — who worked as a lobbyist for the coal industry as recently as May 2017, according to Bloomberg News — explaining that his employment violated Trump's Executive Order No. 13770, which effectively barred former lobbyists from being appointed, without a waiver, to governmental positions in which they would manage issues they'd lobbied on within the past two years. Wheeler never received such a waiver, Public Citizen said. Trump supporters who spoke to NBC News before the president's rally in Great Falls, Montana, on Thursday said Pruitt's decision to resign was the right one for the president. "You don’t need other issues besides what you’re trying to clean up," Dwaine Iverson, a 65-year-old accountant said as he waited in line for the rally. "And when we’re unrolling all the regulations we are, you need to be as clean as you can." And Diane Berry of Ulm, Montana, said Pruitt's departure is "probably not a huge loss." "There are so many good candidates out there," she said. But Dave Riddle, 63, of Great Falls, said Pruitt should have stuck it out. "I think he should have just stayed. I think he got pushed too hard," Riddle said. "I thought he was doing a pretty good job from what I could tell." Environmental groups praised Pruitt's exit, saying the work he did under Trump to reverse Obama-era regulations was harmful to the country and the environment. CREW, the Citizens for Responsibility and Ethics in Washington, released a one-word statement on Thursday celebrating Pruitt's resignation: "Good." The government watchdog group Common Cause in a statement on Thursday called Pruitt’s tenure a “long, unbroken string of ethical lapses, maladministration, and relentless attacks on the environment he was charged with protecting.” The group also called on Congress to hold Wheeler accountable. House Minority Leader Nancy Pelosi, D-Calif., welcomed Pruitt’s departure, saying his "unprecedented abuses of office and his utter contempt for environmental protections put the health of all Americans in peril." But she excoriated the Trump administration for appointing Wheeler, who she called "a coal lobby kingpin," as the acting EPA administrator. "The American people deserve so much better than the Trump Administration's Cabinet of corruption, cronyism and incompetence," she said. Senate Minority Leader Chuck Schumer, D-N.Y., responded to Trump's tweeted announcement with, "Took you long enough." "Still a very long way to go to fully #DrainTheSwamp," Schumer said, referencing Trump’s oft-repeated promise to end corruption in Washington. Rep. Don Beyer, D-Va., also issued a one-word statement on Pruitt's departure.